The mouth carries a large amount of potentially infective microorganisms.Saliva and blood are common vectors of infection.Most people who are carriers of various micoorganisms are totally unaware of it.In other words,you don’t know what kind of bugs your neighbour or your colleague or even your spouse has in his or her system. Therefore,there must be a consistent infection control protocol that needs to be adopted for all in the dental clinic. As much as possible,there should be liberal use of disposable equipments.These are single-use items that are used once and discarded.In the dental clinic,examples of disposables would be the patient’s bib,rinsing cup,saliva ejector(the suction thingy that they put in your mouth to get rid of all the water and saliva),local anaesthetic needles and catridges,surgical blades etc. 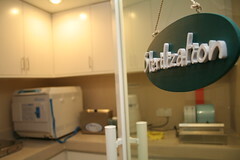 The other instruments or equipments that have to be reused will have to be properly sterilised. Decontamination should be primarily done away from the surgery in a designated sterilisation area.This area would have the autoclave,the ultrasonic cleaner and sinks to wash the instruments. All instruments contaminated with oral fluids should be thoroughly cleaned and sterilised.Cleaning can be done by hand or by using the ultrasonic cleaner before proceeding to sterilise them. 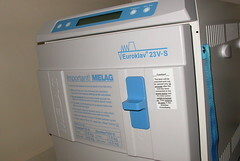 The method of choice for sterilisation is autoclaving.The autoclave has the capacity to sterilise dental instruments from 134-137 degrees Celcius. This would eliminate practically all microorganisms as well as spores. 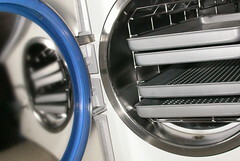 For instruments that cannot be placed in such high temperature,they have to be soaked for a designated time frame in a cold sterilisation solution in order for these instruments to be completely free of microorganisms and spores. Once sterilised,the instruments need to be stored and covered.Sterilisation pouches can be used to store instruments to keep them sterile until the next use. In the surgery,in between each patient,surface decontamination needs to be carried out.All work surfaces should be thoroughly cleaned and disinfected with a suitable surface disinfectant. It is the resposibility of your dentist and the staff of the clinic to ensure that all precautions are taken to prevent any form of cross infection between patients.